The Make Up For Ever Artist Color Pencils (C$23, US$18 / 1.41 g, 0.04 oz) come in 39 shades, all with a matte finish. I received 12 shades to play with, mostly pinks and reds as well as some browns, a beige, purple and grey. The pigmentation and blendability of these are top-notch. 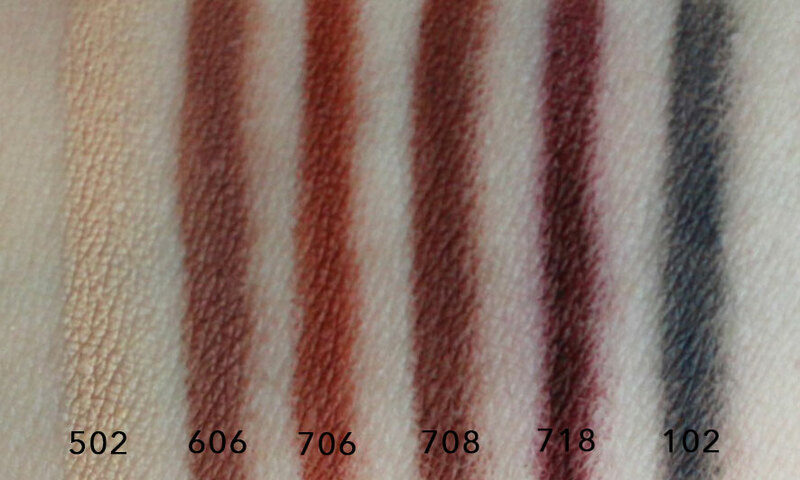 It must be noted that a few shades are not recommended for the eye area (for the ones I have to show you, those include: 706, 708, 710, 718, 800 and 802). For the most part, they are quite creamy (ingredients include silicone, vegetables and crystalline waxes), although I had a bit of a harder time with a couple not gliding as smoothly on the eye area (904, 102). Each colour is labelled and visible on the pencil's cap and opposite tip, making it easy to discern them in your stash. I was hoping one of the colours would work for my brows, but unfortunately, the ones I have are too warm-toned. 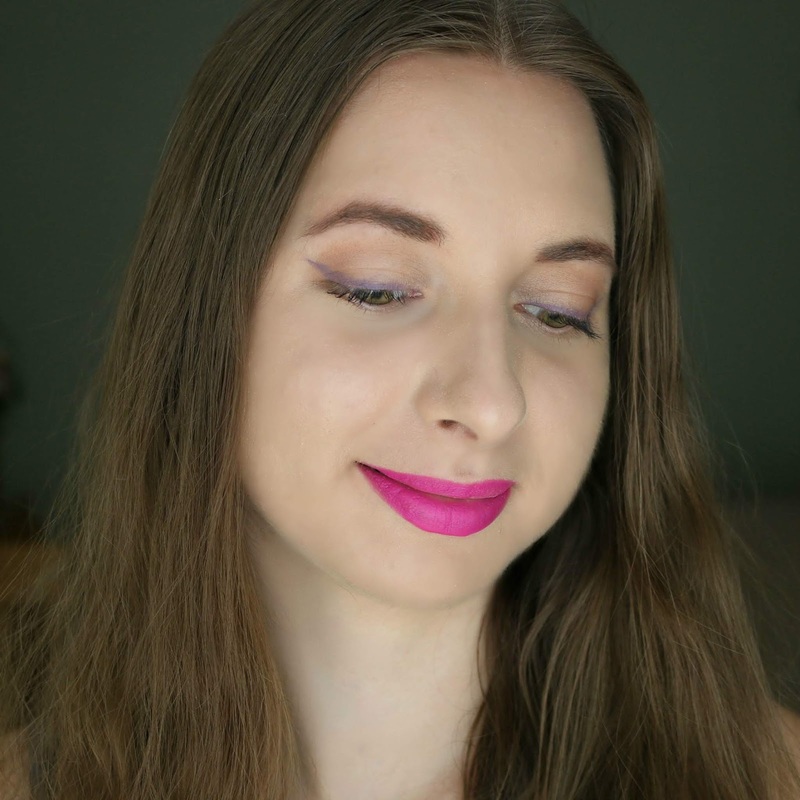 For this look, I used 904 Worldly Mauve as an eyeliner on my lids, 502 Infinite Sand in my lower waterline and applied 802 Fuchsia Etc all over my lips. Here's a closer look (pun intended!) at the eyes. 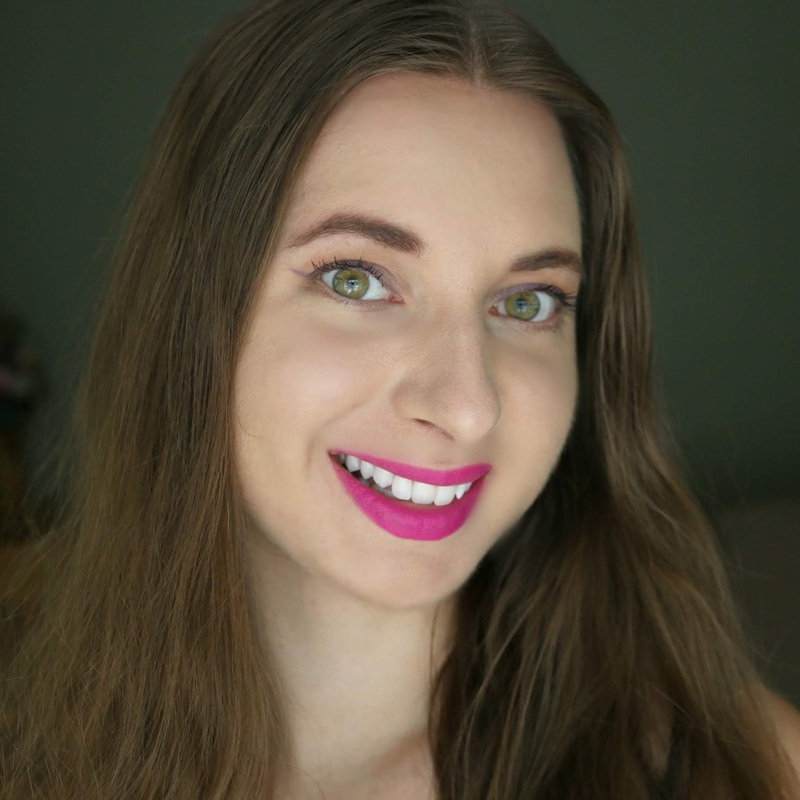 I have really been enjoying bright pink lips lately! Voilà - one more of the completed look! 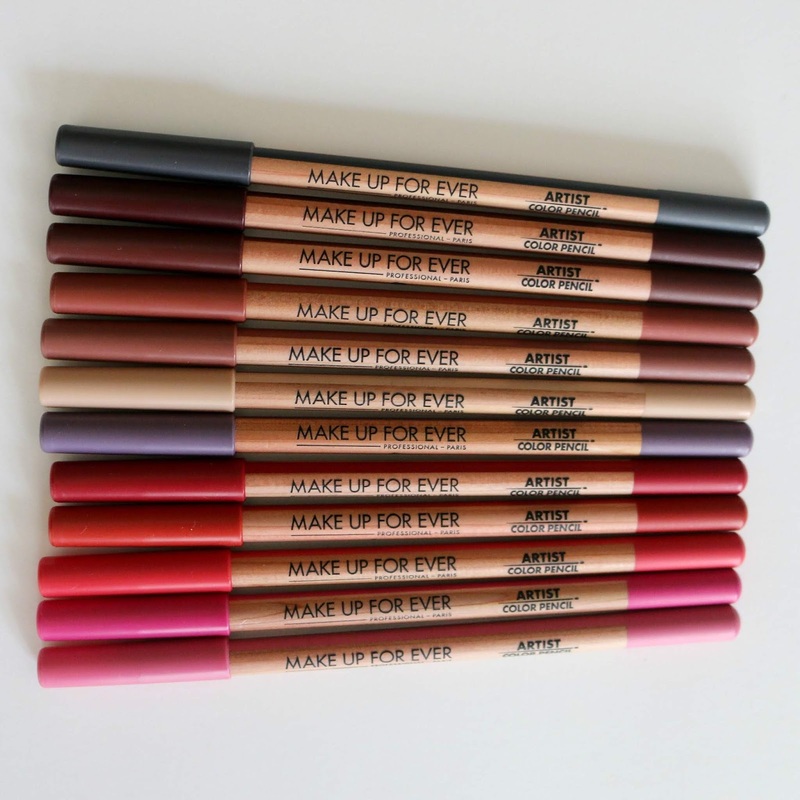 My favourites would have to be the pinks and reds as they melt well on contact with the lips, but if you are looking for a smoother formula on the eyes, I would recommend going for the Make Up For Ever Aqua XL Eye Pencils instead. The Artist Color Pencils are long-lasting - they stay put and do not budge on the eyes, and on the lips, they last me 10+ hours with minimal fading (despite eating, drinking and talking). These do require sharpening since they are made out of wood, but since they are standard size, it isn't too much of a hassle as any regular-size sharpener will do the trick! The Make Up For Ever Artist Color Pencils can be purchased online at Sephora as well as in stores. Do you plan on picking any of these shades up? Make up really is a form of art, oh wait, hence why they're called MAKE UP ARTISTS! haahahahah! But seriously. I am not artist, that's for sure, so I give you loads of credit for making it look GOOD! I do love all the different colors available. Thinking I might like using the pencil they would be easier to handle and apply. 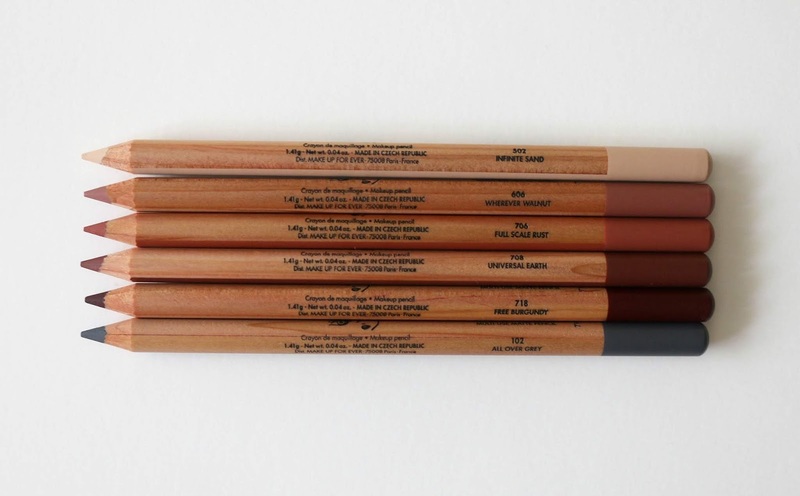 Wow, this is awesome set of Artist Color Pencils. Really like the vibrant colors and I particular like the purpleish pink.... Love it! These Makeup Forever pencils seems great! I have always loved this brand, and totally need to grab a few of these! I like all these colors. I really don't know how to use color pencils. I do have a black one that I use to line my eyes at times, but that's about as far as I've gone! Your makeup style is so great and those pencil colors are so amazing. I need a good one for my brows but your lips are so special. I usually stick to nudes and browns/beiges/etc., but some of these colors are absolutely gorgeous. I had never heard of this brand before and will have to keep an eye out for it. I'm always looking to try new lines! The bright pink lip suits your face. I am not good with pencils. I can't draw a straight or curvy line to save my soul! I've never seen makeup pencils like that before. They could be really helpful for simple eye colors, I stink with the large tip applicator things some of them have. I love that shade of purple on your lids! Complements you so much. The pencils look so creamy and that they have a great application. These colors are exceptional and vibrant. They look great on you and you do a very nice job with your makeup. These are some beautiful shades! I need to update my collection and I am going to try a few of these out, thanks! So many pretty colors! Would you mind telling me what type of light you use because your videos and photos are so beautiful and clear! That is so kind of you to say :) I just shoot with my DSLR in natural lighting! I wish I was more daring with colors. That pink is so bold and looks stunning on you. I don't know why I let some colors frighten me away. I'm sure it would look wonderful...I just need to branch out and give it a try! Wow! Another great collection from our Make Up For Ever Artist Color Pencils. Loved everything on this list. Thank you for a great review. Those all look amazing! The pigmentation is on point. I can't decide which color to try first! These are some gorgeous colors! I need to try a few of these for myself!! Art is tough for me too and is still tough now that I'm adult. I don't even know how to put make up on lol. Makeup Forever is one of the first brands I tried and fell in love with. I love that they have been all about color and diversity since day one. These looks awesome! I'm a big fan of the brand and most especially the pink color lipstick. Actually I have few shades of pink in my vanity right now perfect for any season and any occasion. What a fun idea! I am not a fan of the brighter colors on myself, but I really love that mauve. So pretty! It really gives you a lot of options. So many different shades! 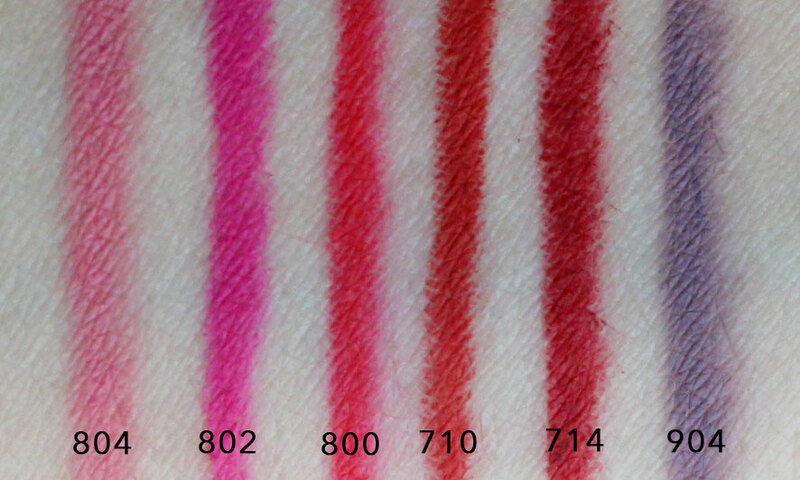 And all the pigments look so so strong! I'd defo pick a few! The pigment on these are really nice. Loving the swatches! 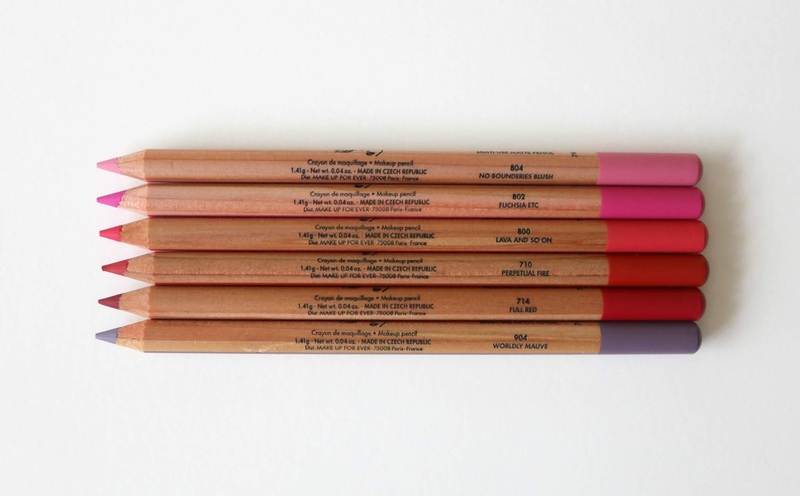 I never tried these pencils, but I love the brighter colors, especially during summertime. These are amazing colors. I love the 102 greyish blue color. Thanks for sharing. I love makeup forever because of their wide foundation shade range. As a black woman, it can be very hard trying to find makeup that works for our skin tone. I'm not sure how well these color liners will show up on my dark skin, but it's worth a try. Makeup Forever is one of favorite brands. The saturation of the color pencils look so rich. I hope it looks just as good on darker skin tones. Love all of these products! Makeup Forever is one of my fav brands! Love the full red pencil! Such a great post! I love the colours and the makeup is unique. Lovely post. Those are super pigmented! I will have to check them out! Oh...the #804 and #904 are so beautiful! I am loving all of these colors. You look fantastic wearing these! Lippies as in liners, lipstick, crayons are my favorite beauty products. I just love them. I've not tried much from this line therefore I will be looking to get a couple of these. That color looks wonderful on you.